Abstract: Objective To investigate the expression and prognostic significance of DEAH-box helicase (DHX16) by pan-cancer analysis. Methods The expression and prognostic significance of DHX16 were analyzed using the UALCAN web-portal. Gene ontology and kyoto encyclopedia of genes and genomes analyses of proteins interacting with DHX16 were performed using DAVID 6.8 functional annotation software. Results DHX16 was highly expressed in bladder urothelial carcinoma, head and neck squamous cell carcinoma, esophageal carcinoma, liver hepatocellular carcinoma, and cholangiocarcinoma (all P < 0.001). Proteins interacting with DHX16 were located mainly in catalytic step 2 spliceosome, nucleoplasm, and cell membrane, and participated in mRNA splicing and processing, binding to poly (A) RNA and nucleic acids, and RNA helicase activity. 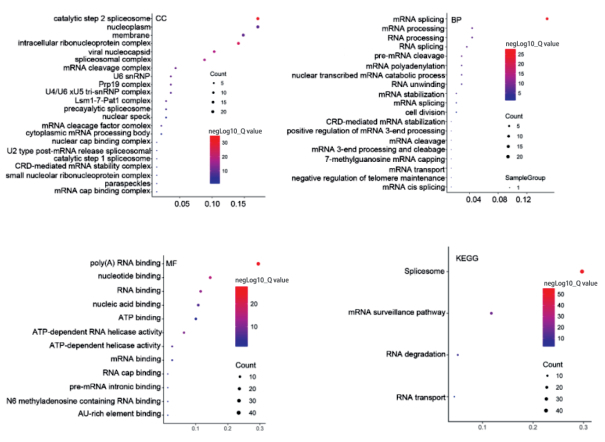 Spliceosome, mRNA surveillance, RNA degradation, and transport pathways were implicated. Conclusion The high expression of DHX16 is helpful for the prognosis of bladder urothelial carcinoma prognosis, and unfavorable for prognoses of adrenocortical carcinoma, sarcoma, brain lower grade glioma, liver hepatocellular carcinoma, and acute myeloid leukemia. Thus, DHX16 may have value as a prognostic marker. CORDIN O, BANROQUES J, TANNER NK, et al. The DEAD-box protein family of RNA helicases[J]. Gene, 2006, 15(367): 17-37.